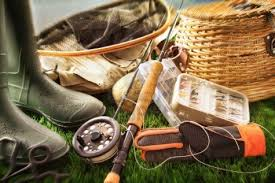 The Club is able to offer advice on all types of Fly Fishing Gear, it may be for a beginner looking to purchase gear, or the more experienced looking for some advice. It can be a confusing time starting out with different weighted rods, packs or vests, reel sizes get the right advice to start the sport correctly from our experienced members. Our many sponsers also offer a great range of equipement and advice. The club has a number of rods for Casting Tuition on a Sunday for more information contact the club or alternatively check our Courses page for upcoming tuition.